Otherwise known as Bosch Healthcare’s ViTelCare T400 Home Health Monitor, the device – about the size of a small microwave oven – is drawing rave reviews from healthcare providers and their patients. About 130 “turtles” have been distributed to 60 sites by the Alaska Federal Healthcare Partnership (AFHCP), with plans to bring that number up to about 300 by the end of the year. In development for more than seven years, the “turtle” securely transmits patient data – either automatically or manually – several times a day, and offers a touchscreen interface and audio-enabled health assessment questions. “This is an amazing technology,” said Samuel C. Johnson III, executive director of the AFHCP, a voluntary partnership of the state’s federally funded healthcare agencies, spanning six regional tribal hospitals, 39 independent native health agencies and 203 tribal health centers and clinics. “It’s simple, it’s reasonably inexpensive … and it gives people the ability to manage their own healthcare,” he said. That’s important, Johnson adds, in a state where people would just as often use a snowmobile, dogsled, boat or helicopter as a motor vehicle to get to a hospital. Add to that the fact that more than 10 percent of the population suffers from some sort of chronic condition, and the need for continuous care is vital. “Sometimes we have no contact with a patient unless there’s an episode, and by then it’s too late to do anything except get them to a hospital,” he said. The nation’s largest state in terms of area, Alaska offers a number of factors that make it a hotbed for telehealth projects. Its small population (a little more than 710,000) is spread out over a challenging landscape, ranging from the rocky coast and Aleutian Islands to Denali’s rugged interior to the Arctic Circle. That population includes a significant number of military personal (45 percent of the state’s population) and indigenous people – the former of which have benefitted greatly from telehealth programs, and the latter of which could. (As further evidence of the state’s influence on telehealth conversation, the American Telemedicine Association this month hosted its annual mid-year conference and exposition in Anchorage, drawing hundreds of healthcare executives and experts to a location normally thought to be on the fringes of the conference map. It also doesn’t hurt that the ATA’s vice president is Stewart Ferguson, CIO of the Alaska Native Tribal Health Consortium (ANTHC), which oversees much of the state’s telehealth initiatives). The ViTelCare T400 is one of two systems pioneered by Robert Bosch Healthcare, the Palo Alto, Calif.-based division of the international technology giant. Bosch has been working with the U.S. Department of Veterans Affairs for little more than a decade, first through the Health Buddy System and then the so-called “turtle.” In Alaska, Bosch is partnering with Michigan-based Critical Signal Technologies, Inc., to deploy the “turtles” to AFHCP members. Tim Scheffel, medical director at the Dena’ina Health Clinic in Kenai, part of the Kenaitze Indian Tribes Health System, has been using the “turtle” for roughly four years, starting with an enrollment of six and now the largest clinic user of the devices. “Patients have also indicated that they appreciate that there is somebody else monitoring them on a fairly continuous basis, receiving calls from the call center, which we’ve received positive feedback on as well,” Scheffel added. In making the case for the “turtle,” Johnson cites one cardiac patient who’d been transported by helicopter to a hospital five times in one year, costing the system $22,000 per flight and spending a total of 53 days in the hospital. The patient, he said, suffered from a laundry list of chronic conditions – COPD, diabetes, hypertension, congestive heart failure and weight problems. The patient was assigned a “turtle” three years ago. “For over three years, he stayed out of the hospital and off the Medivac flight,” Johnson said. Scheffel said he sees similar results. Working alongside Johnson’s AFHCP, the ANTHC administers the AFHCAN Telehealth Solutions program has recorded more than 100,000 telehealth encounters since its inception in 2001 – saving more than $6 million annually in travel and healthcare expenses. 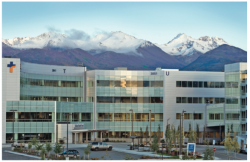 The AFHCP’s Alaska Native Medical Center in Anchorage is the state’s only Level II Trauma Center, receiving about 3,000 remote cases a year for telehealth consults, of which 20 percent are turned around in one hour and 75 percent are turned around in a day. Aside from the home health monitoring program (of which the AFHCP’s “turtles” play a large role), the state’s telehealth initiatives include an extensive videoconferencing system. In addition, AFHCAN has lent its hardware, software and training expertise to other Indian Health Service projects in the lower 48 states, recently helped send 35 telemedicine carts to the Maldives, an island nation off the coast of India, and has seen its tConsult software used by the Canadian Space Agency. Johnson hopes to draw on the “turtle’s” success to push for more telehealth projects in the state, including an ambitious plan to push clinic-based behavioral health services out to the field through a telebehavioral health solution. With reimbursement being the biggest impediment to physician adoption, he’s looking at pilot projects in other parts of the country that have tried paying providers a set fee for each referred patient, or even creating an awards program. “This technology isn’t a cure for a bad patient, nor will it (entice) a physician who doesn’t want to use it. We need to educate everyone about the benefits, and to find a little bit of reimbursement to help the providers move in this direction,” Johnson said. “Anytime you can touch a patient, help them along, motivate them to improve their health, that’s what this is all about,” Johnson said.